Art critic Ian Mayes summed up his work most succinctly in his review of his 1975 exhibition at St Catherine’s College, Cambridge. 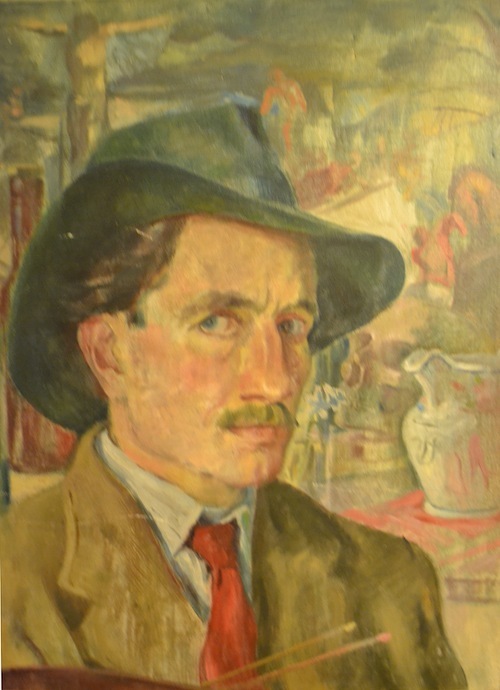 After the Second World War he was offered his first teaching job at Northampton Grammar School where he worked and painted prolifically until he retired. His art room was always a scene of intense creative activity, its walls bursting with papier-mâché figures, African masks, abstract paintings, and portraits of his pupils. The scent of glue-size, linseed oil and turpentine, the dust of plaster of Paris and powder paint filled the air. He would often paint striking reproductions of famous paintings to illustrate his lessons; the sets for the schools regular theatrical productions would be designed, painted and constructed in the art room. David Gommon taught me both ‘O’ and ‘A’ Level art as a pupil at Northampton Grammar School in the early 1960’s. I came from a working class background with no contact or necessity for art whatsoever. The school was essentially academic. I was not! I arrived in the art room by default rather than intent. David’s way of teaching had a gentle subtle reality. He was not overtly demonstrative, but worked by trailing ideas and suggestions across ones often determined unconscious. I remember images of artists’ work placed by him in the corridor where we waited to go into the lesson: Matisse’s goldfish, Braque’s stylised dove, cubist works of Picasso; images that sank in subliminally. And then all around the art room large reproductions of the Renaissance masters. Particularly I remember early Renaissance works by Giotto, Martini, Duccio and the Botticelli and Piero della Francesca masterpieces. At the time they meant little to me, but I remember he suggested (I stress he suggested – his method was to infiltrate rather than to direct.) that I tried to copy a head of Christ by Giovanni Bellini, through which, with his occasional help and gentle prompting, he opened up the brilliance and power of such work. I remember he was often working on a painting of his own while the few A Level students were occupied on their own work. The experience of seeing an adult manipulating paint seriously, but with lightness of touch, connected me to the relationship with creativity that I know forty years later in my own work; as a complex and creative freedom. Many of the lessons that I imbued in my adolescence because of David’s influence have been further enriched by the discovery, steadily as an older person and over a much longer time, of the significance of David’s oeuvre. I am convinced that to have any long term capacity to enrich and nourish all souls travelling through the mystery of our individual existence, that an element essential to counter balance the cerebral and functional analysis of an age, is that of poetic content and insight, and it is this that David offered in total measure. The impact of the forces of existing that we sense through all living things and the forms that impact upon us; the ocean, trees, landscape, are a song of energy manifest, and this I know David captured and conveyed and offers. It is both as intangible and as obvious as love. His work expressed as vision still informs my hope and I still use this in my own creative search for expression today. During the war, when his spinal curvature rendered him unfit for military service, he served in the London Auxiliary Fire Service and was on duty in the City near St Paul's cathedral during the blitz and firestorm that followed. He armed himself intellectually for whatever would follow the war by devouring the work of the great philosophers, Goethe, Tolstoy, Dostoevsky, Stendhal, Flaubert; a sort of one-man open-university. During the war he had met and married Jean Vipond through a chance telephone conversation, an early virtual relationship that blossomed into a very real one. David Gommon was an intrepid cyclist who never learned to drive. He cycled to Scotland in his teens to visit his mother’s homeland. In his twenties he went on a cycling tour of Dorset with a fellow art student. There in a pub in a small village he met a slightly tipsy man reciting poetry at the bar. This man, Mr Pooley, invited him to stay at his cottage, and it was through this meeting that he discovered Thomas Hardy and his second home. He fell in love with Dorset and the Pooley family. It was his discovery of the Dorset landscape around Hartgrove as a young man in the 1930’s that opened his eyes to a particular and ancient landscape which he explored and returned to in his paintings throughout his life. As he looked hard at the form of this landscape he developed an eye for what lay beneath the surface, the forces that had formed it and a sense of its hidden history. However, in 1938, in his mid 20’s the second cataclysmic event of the C20th was about to happen, and the atmosphere was charged with latent violence. For a painter who had been immersing himself in the landscapes and rural life of Dorset, and who tried to express the joy and beauty of the creation in his work the tension between reality and his inner creative life must have become unbearable. For an artist to have the right to bear the title he or she must seek the truth and express that truth with all their creative gifts. He stopped painting altogether in 1938, only starting again in 1944. At 16 he was enrolled in Battersea Polytechnic and the Clapham School of Art. By subsisting on odd jobs he visited the art galleries of Holland to study the paintings of the great masters. It was at this time that he met a champion of modern art and an enthusiastic collector, Lucy Carrington Wertheim. When he was 18-19 she became his patron, and he was paid £2 a week for “practically all the work I did-and I did a great deal”. Lucy Carrington Wertheim was a Manchester woman who was a C20th English art enthusiast. Her book Adventure in Art contains references to David Gommon’s first one-man show and a reproduction of one of his paintings. Her book is mostly concerned with the Twenties Group that included Christopher Wood, Barbara Hepworth, Roger Hilton, Robert Medley and Victor Pasmore, her twenty year old protégés that she supported and promoted. She used her own finances to support these young painters and devoted a huge amount of her time and energy to promoting them. She properly deserves to be better known and celebrated. It was through Mrs Wertheim that David Gommon held his first one-man show at her Burlington Gardens Gallery which attracted positive critical attention. Through Mrs Wertheim he also met other patrons of the Arts; Lilian Baylis at Saddlers Wells allowed him to work backstage where he painted the young dancers Margot Fonteyn and Robert Helpman. In Mrs Wertheim's time most English collectors were not interested in their own countrymen’s work but preferred to patronize European painters. She found this frustrating and misjudged. Lucy Wertheim remained a friend of David Gommon all her life, and spoke at the opening of one of his last exhibitions at The Herbert Art Gallery in Coventry. Titian, Rembrandt, Cezanne, William Blake and Samuel Palmer were David Gommon’s formative influences. In his first one-man show at Mrs Wertheim’s Burlington gallery his work was categorized as ‘Neo Romanticism’,(link to Wiki) a loosely based school of English painting that emerged in the 1930’s through a new found interest in Blake and Palmer. Fellow contemporaries who are associated with Neo Romanticism include Paul Nash, Henry Moore, John Piper, Graham Sutherland, Stanley Spencer and Eric Ravilious.